Leontes, King of Sicilia, gets a dangerous idea in his head: he is convinced that his wife is having an affair with his friend, Polixenes, King of Bohemia. This idea and his fervent jealousy set in motion a series of not-so-credible events. It’s hard to get emotionally involved in a story that doesn’t seem to have rational motivation. Amidst huge white Greco-Roman pillars, Hermione (Sereana Malani) pleads her innocence with strength and determination. Leontes (Kevin MacDonald) seems completely out of his mind as he blindly accuses his pregnant wife and has her jailed. “My wife is a hobby horse,” he says. He is so consumed with anger that he asks his friend, Camillo (Laara Sadiq), to murder Polixenes (Ian Butcher). To add insult to injury, he rejects his newborn daughter and has her banished. All the while, a masked Greek chorus looks on, reacting with subtle, perfectly-timed body language. The masks were a wonderful device, used not only for this group of onlookers, but also for secondary characters in many scenes. During Hermione’s trial, two stands of masks filled out the captive audience. The first half of the play is all about Leontes, a tragic hero who causes death and destruction for his family. The minimalist set of movable pillars is matched by minimal action and a plot that doesn’t seem to be based in any sense of rationality. Leontes is not a sympathetic hero, and his actions seem completely out of touch with reality. The most exciting moment of the first half was seeing what they did with the famous stage direction, “Exit, pursued by a bear.” I won’t spoil it for you. The second half is a complete change of tone and finally provides some comic relief and more interesting performances. We are taken to Bohemia to see that the banished baby has been raised by an old shepherd (David M. Adams) and has grown up to be Perdita (Kaitlin Williams). She falls in love with Florizel, son of Polixenes. Their relationship is controversial, but little does everyone know Perdita also has royal blood. Ben Elliot as travelling salesman/cutpurse Autolycus stole the show for me with his comedic timing and grand gestures. He ends up switching clothes with Florizel (Austin Eckert) and the plot finally has some intrigue with this disguise, a sheep-shearing festival, and the young love of Perdita and Florizel. The worlds of Sicilia and Bohemia are brought to life with Pam Johnson’s simple, versatile set design and Carmen Alatorre’s loosely flowing dresses, togas, and Greek sandals. 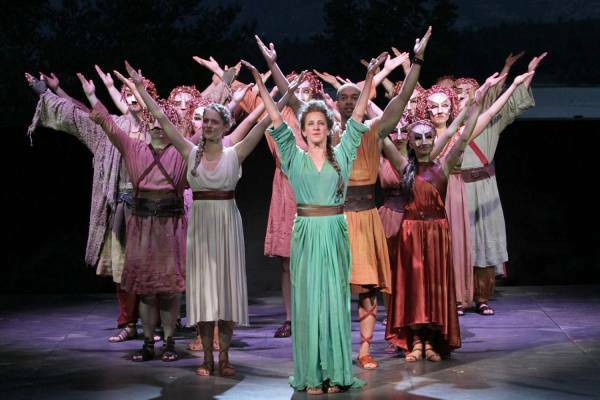 Tracey Power’s choreography enlivened the opening scenes and made the Greek chorus more than a simple background element. What begins as a tragedy ends as a comedy in this tale that shows us the dangers of jealousy and the power of redemption. It was hard to relate to these characters and their struggles, but this is still a magical production that has redeeming qualities and a mysterious tale to tell.